The Toggenburg is a Swiss dairy goat from Toggenburg Valley of Switzerland at Obertoggenburg. 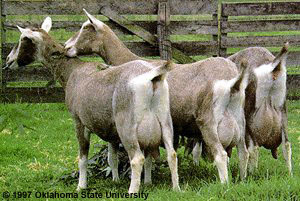 They are also credited as being the oldest known dairy goat breed. This breed is medium size, sturdy, vigorous, and alert in appearance. Slightly smaller than the other Alpine breeds, the does weight at least 120lb/55kg. The hair is short or medium in length, soft, fine, and lying flat. Its color is solid varying from light fawn to dark chocolate with no preference for any shade. 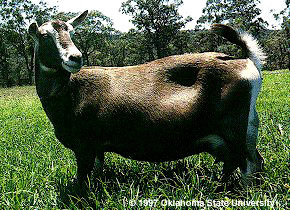 Distinct white markings are as follows: white ears with dark spot in middle; two white stripes down the face from above each eye to the muzzle; hind legs white from hocks to hooves; forelegs white from knees downward with a dark lien (band) below knee acceptable; a white triangle on either side of the tail; white spot may be present at root of wattles or in that area if no wattles are present. Varying degrees of cream markings instead of pure white acceptable, but not desirable. The ears are erect and carried forward. Facial lines may be dished or straight, never roman. Toggenburgs perform best in cooler conditions. They are noted for their excellent udder development and high milk production, and have an average fat test of 3.7 percent.